Five years ago, during the World Economic Forum Annual Meeting in Davos, we asked executives of the world’s largest energy companies, policy-makers and thought leaders from across the energy value chain: to what extent do you expect global energy systems to change over the next 10 years? An overwhelming 90% expressed the belief that significant change would occur around the world, and nearly one-third predicted a radical shift in the way energy is sourced, transformed and consumed. Reflecting on this today, the world is inarguably in the grips of an ongoing energy transition which is gathering momentum as unprecedented structural changes take place in global energy systems. The Global Energy Architecture Performance Index Report 2017 shows that a selection of countries are establishing themselves as masters of the energy transition, while others are gearing up to challenge them. Some of these are highlighted in the figure below. Many countries, however, are still struggling to overcome the complex challenges of managing the numerous trade-offs associated with creating a balanced energy system across each side of the energy triangle: providing affordable, secure and sustainable energy. This year’s report discusses a number of important principles for energy sector governance which are seen to be effective at steering energy systems through transition. Beyond these principles, there are three other crucial considerations which countries should focus on to ensure that they come out on top as the winners of the future. As always, underpinning these three considerations is the necessity for countries to strive for balance and make trade-offs to ensure solutions best fit a country’s individual circumstances. There is no one-size-fits-all approach to becoming a winner of the energy transition, and the differences between countries mean that each needs to find its particular path. Energy security is more aligned with resilience than independence. One of the most important steps in ensuring security of supply is to establish energy sources that are inherently invulnerable because they're diverse and dispersed. Never before has the playing field been so even for any country to achieve this. No longer are countries limited by a lack of hydrocarbon endowment, or unsuitable geographic conditions for hydropower. Costs of renewable technologies have plummeted over recent years, allowing exploitation of natural resources which every country has, sunlight and wind. 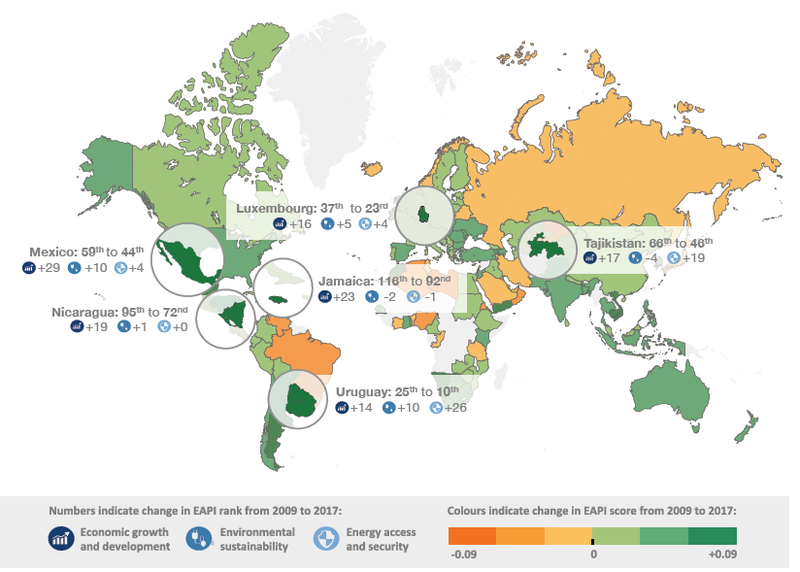 Uruguay is noted in this year’s report as a country which has achieved substantial performance improvements since the 2009 EAPI benchmark, moving up 15 places in the ranks to hold 10th position. Part of this performance improvement has been driven by a significant ramp up in the installed capacity of solar and wind energy. This action addressed a historic security of supply issue caused by overreliance on hydropower, which resulted in power cuts during droughts and required the combustion of expensive imported oil to pick up the slack. Carbon emissions from fossil fuels are showing signs of a potential peak due to rising energy efficiency and a slowdown in the growth of emerging markets. However, whether or not this plateau of emissions will continue for long in this time of political uncertainty remains to be seen. A plateau of emissions will also not be enough to limit the world’s temperature rise to the ambitious goal of 1.5C, and dramatic reductions are needed if this is to be achieved. The steps individual countries will need to take in order to honour their INDCs will drive improvements across every dimension of the energy triangle. Substantial increases in energy efficiency will have both a positive impact on economic growth and development, through decreased energy intensity, reduced import bill and improved energy security. After all, the foundation of a secure energy system is to need less energy in the first place. Furthermore, emissions reductions will require a greater diversification of total primary energy supply to include a higher proportion of low carbon sources, including natural gas and renewables, resulting in a more secure and sustainable energy system. However, staying below the 1.5C limit requires reductions in emissions far beyond the cumulative impact of all INDCs, and is instead expected to be achieved through the use of negative emissions technologies, primarily bioenergy with carbon capture and storage. To make this a success will require governments to demonstrate strong and sustained support for the involved industries, and to drive and steward investment to ensure current carbon capture and storage technology barriers are overcome. The political disruptions of 2016 shone a spotlight on the vast social inequalities that remain in some of the world’s most developed economies. Decades of policy focused on globalization and growth have left large swathes of the population feeling left behind, harbouring a growing level of discontent which eventually resulted in votes for radical change. It has never been so important to establish inclusive energy systems that work for everyone. Beyond the pressing need to address the low levels of electrification in some developing countries, countries with comprehensive grids and a high quality of electricity supply face residual, and possibly growing, challenges with energy poverty. Affordable access to energy is a critical component of modern life, and countries need to make sure that the most vulnerable parts of their societies are provided for and protected. Energy poverty needs to be tackled at its foundations, through energy efficiency measures and helping consumers easily find the most affordable solutions to their energy needs. As the consumer increasingly becomes the centre of the energy system, with the ability to produce, store or sell their own electricity, a concerted effort is needed to ensure that energy system inequality shrinks rather than grows. 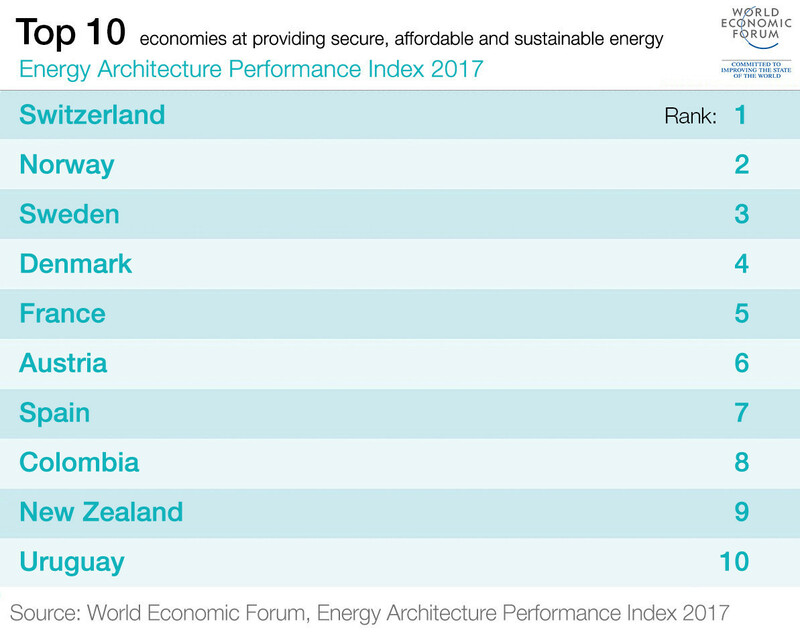 The Global Energy Architecture Performance Index 2017 is available here. Explore the results of the report using the heatmap below. How do we design an inclusive energy transition?